A past musical project of mine, and the one Professional! Studio! Recording! of my music, which is why it has a price tag on it - recording ain't cheap, and the sound quality is fantastic on these tracks compared to the living room recording quality (you know... intimate! in a "the dishwasher may be audible in the background" way!) 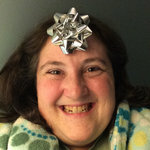 of most of my bandcamp offerings. 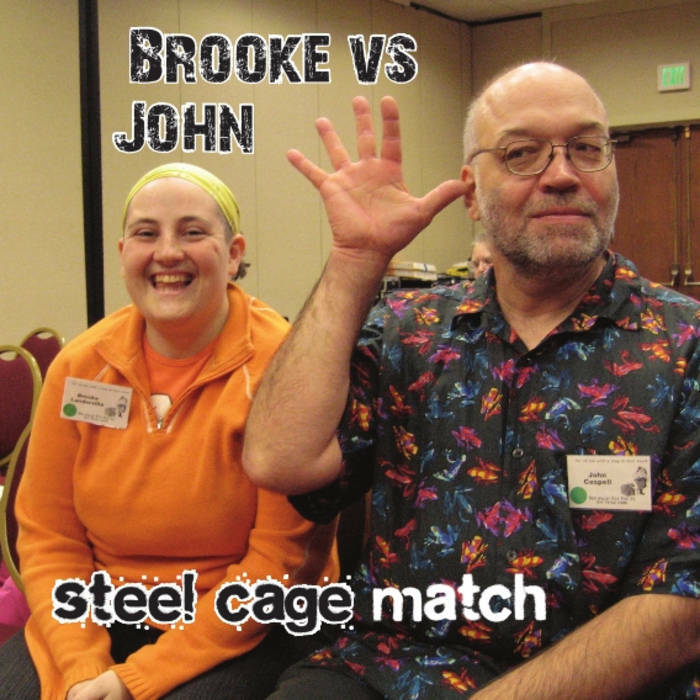 Steel Cage Match is 15 tracks of Brooke & John causing trouble, in a low-profile sleeve case sealed with a pharmacy warning label. (See below for more about John, my wonderful guitar-playing pal!) Why is it the same price as the digital album? MY APARTMENT IS OVER-RUN BY THEM. The shipping is kind of intense, though, because alas, that's what it costs. Includes unlimited streaming of Steel Cage Match via the free Bandcamp app, plus high-quality download in MP3, FLAC and more. A past musical project of mine - and the one Professional! Studio! Recording! 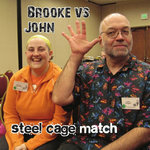 Brooke vs. John were a filk duo from British Columbia, Canada. 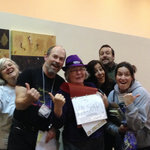 Filk is folk music with a science fiction twist, and Brooke & John are definitely twisted. If you know just what to wear to a mad science cabaret, if you cried when Wash died, if you could make practical use of a sea shanty for bloggers, you'll love this album. 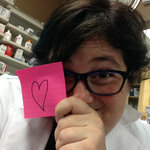 Brooke Abbey (formerly Brooke Lunderville) is a pharmacist from Vancouver, BC, and you can detect the influence of her science day-job and her science fiction hobby in the songs she writes. Her compositions range from grim to ridiculous to sad to silly, sometimes in the same song. Her strange metaphors are a refreshing break from the usual singer-songwriter fare, and if you listen closely, you can hear her evil grin. Brooke plays banjo as well as an unusual hybrid instrument: the banjola. A banjola has the neck of a 5-string banjo and the body of a mandola (a bigger, deeper version of a mandolin.) The result of this mutant alliance is that you can hear Brooke's banjo technique transformed in to the sweet, sustaining tones of a mandola, with a twangy bluegrass twist. John Caspell has been playing guitars of all kinds for 38 years, and you can hear it. He got his start playing in the London, Ontario folk scene, and discovered filk music - the folk music of science fiction - 18 years ago, and hasn't looked back since. He is renowned for his fingerpicking prowess, his incredible repertoire of hundreds of memorized songs, and his ability to tame the mighty 12-string. On this album he plays a Guild 6-string, a Guild 12-string, and a Tacoma 6-string baritone guitar. John was struck by a car and passed away unexpectedly just after the album was recorded. He is greatly missed by his friends, family, and musical colleagues. We are grateful to have captured recordings of his skillful guitar playing while he was alive - and hope you enjoy listening to them. We miss you so much, John. All tracks engineered & produced by Tony Fabris at Monkey Brains Studios, Seattle, Washington. Mastering by John McCaig at panicStudios, Seattle, Washington. I'm afraid you're not my type. Honey, this will never work. C minus. I'm so misunderstood. How long must I wait to hear your reply?